Last year, I hosted a Valentine's cookie decorating "party" at my house; it was a blast, so I decided it's going to become a tradition. 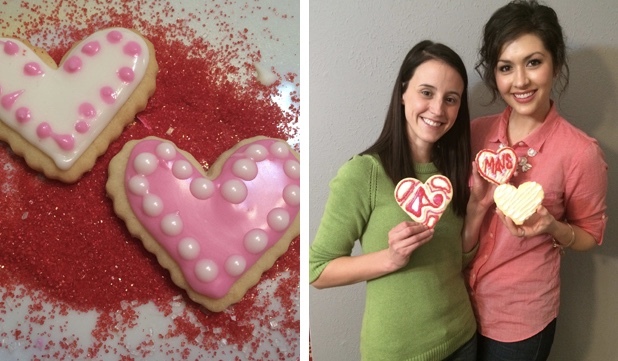 Yesterday was the "2nd Annual Valentine's Cookie Decorating Party." All of the girls loved having an excuse to relax, catch up, and eat a few cookies. This is an easy event to plan; you can make it as simple or complex as you like. baked sugar cookies earlier in the day, then made a batch of royal icing and divided it up into white, pink, and red. I like to use squeeze bottles when icing cookies- they offer a lot more control than traditional pastry bags.Fresh flowers can transform a table/event space; I loved arranging a mixture of roses and flock for an organic, natural-feeling centerpiece for the table. If you don't already have a plan to spend time with your girlfriends this Valentine's Day/week, cookie decorating is a great way to do it. Have fun! I'm listing my favorite baking supplies below so you can shop them online and be ready for your own cookie decorating party; this would be a great activity for any holiday or just for fun.